Product specifications interface: standard USB 3.0 (Backward compatible with USB 2.0) compatible operation systems: Windows98/SE/ME/2000/XP/Vista/Win7/win 8/Mac OS 8.6 and more Compatible with: PC, laptop, comprehensive computer, internet PC hard disk reader supportive installing systems: XP, win 7, Win 8 reading Speed: DVD-ROM 8x; CD-ROM 24x writing speed: DVD-R, DVD+R 8x; DVD-RW 4x; CD-R 24x supportive disk format: 12cm net weight: 300G Dimensions: 14*14*1.2 cm main Features fully plug & play, easy to install and use USB 3.0 cd drive provide faster data transfer speed, up to 5Gbps. Ultra slim and light weight, classic appearance Designed. Embedded cable design, convenient for carry brand New import chip, power ability to correct errors, shockproof, low level noise introductions 1.This product is a data line interface properly to USB port of the computer, The computer display lower corner should Opera device Icon. 2.Click on the desktop, open the "my computer", in the mobile storage device should display the drive Icon. 3.Click on this icon button, select the "pop" In the tray into the appropriate disk read 4.Do not place the drive close to any magnetic object. 5.To ensure normal running, please place the drive On flat desktop, do not place the drive under any pressure. High speed USB 3.0 interfaces slim asn store portable size is equipped with USB 3.0 high speed interface, which delivers faster speed data transfer and stable performance to a maximum of 5Gbps). Perfect compatibility this external drive perfectly compatible with Windows 98/SE/ME/ 2000/XP/Vista/windows 10/8/7, Mac OS 8.6 and more. Perfect designed for all kinds of devices, including PC, laptop, comprehensive computer, internal PC hard disk Reader. 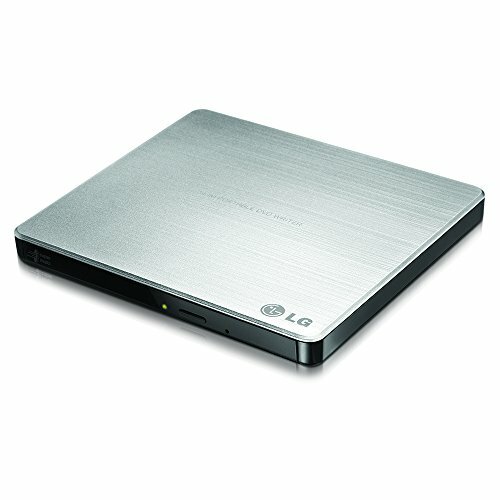 Multifunctional optical Drive USB 3.0 DVD driver is a perfect companion for computers without the internal Drive.Powerful error Correction function, shockproof, low noise, horizontal and vertical Manipulation.High quality with 30 days Product Replacement or refund if you are not satisfied. 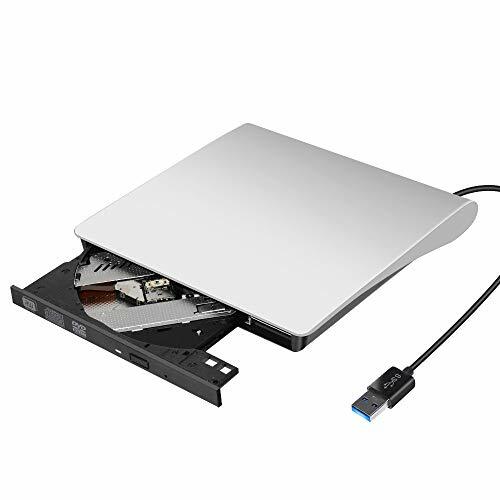 VersionTech Ultra Slim USB External DVD Drive Burner is special designed for the Apple Macbook, Macbook Pro, Macbook Air or other PC or Laptop without internal drive. No eject button design, powered by USB port from your PC or Laptop, plug and play. It's fully compatible with Mac or Windows OS, no need to install any driver program. 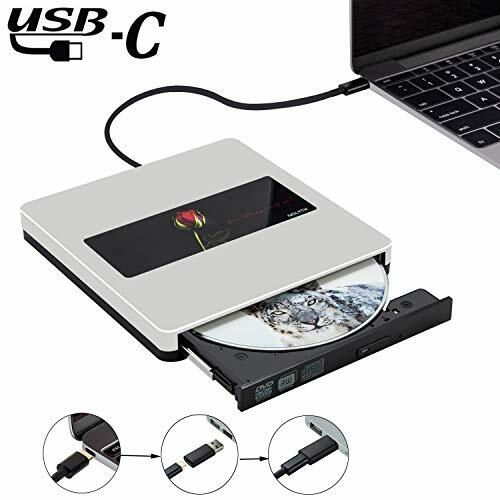 More convenient for you to play music, movies or install software with this USB external DVD drive, copy & burning music from your laptop to a CD disc in a flash. Features :  100% Brand New and High Quality. Ultra Slim and Lightweight, Classic Appearance Designed. Support DOS Start and System Recovery. Brand New Import Chip, Power Ability to Correct Errors, Shockproof, Low Level Noise. Route Optimizing Design for Power Saving and Low Power Consumption, NO External Power Required. Easy to install, Plug and Play, No Any Driver Required(Excluded Windows 98SE). Unique Intelligent Replication Technology, easy to Pause or Record Files. Automatic Slot in Design for the Disk, Prevent cockamamie process of opening or closing the machine's door by hand. Compatible with All Laptop and PC with USB Port. Specifications : Writing Speed :8X Speed +R 4.7GB; 8X Speed +R(DL); 6X Speed +RW 4.7GB; 24X Speed CD-R; 16X Speed CD-RW Reading Speed : 24X Speed CD-ROM Reading; Buffer Under Run Protection Support USB2.0 (480Mb/sec), fully backward compatible with USB1.1 (12Mb/sec). Troubleshooting Methods : Q: CD was stuck A : 1. As insufficient power supply, the dvd drive should be connected with USB port on laptop rather than connect with USB HUB. In addition, please connect the item with USB port behind of computer host if you use a desktop. 2.Check the cd is unwounded and not out of shape. 3.Eject cd by clicking eject button on computer. Q: Driver cannot be recognized by computer or it cannot play cd well A : 1,The dvd drive should be connected with USB port on laptop rather than connect with USB HUB. In addition, please connect the item with USB port behind of computer host if you use a desktop. 2. Ensure cd is placed well and not scratched. 3. Ensure there is a build-in practical driver software. Or try it with another computer. 4.Setting area code according to different regions. Q: Making Noisy A : Some of DVDs is thicker than common discs, it is normal phenomenon with a bit noisy. But please ensure cd is placed well and not scratched. Q: Trouble in burning A : Blank cd is unformatted, please download a software-NERO, to finish the setting and add something that you want to burn. Usually, it works well with cd that in format: WAV, MP3, MP4, etc. Introductions In Operating : .This product is a data line interface properly to USB port of the computer, the computer display lower corner should opera device icon. .Click on the desktop, open the "my computer", in "the mobile storage device should display the drive icon". .Click on this icon button, select the "pop" in the tray into the appropriate disk read. .Do not place the drive close to any magnetic object. .To ensure normal running,please place the drive on flat desktop, do not place the drive under any pressure. BE CAREFUL : Internal laser light source may be harmful to the eyes of the face, please do not look directly. Do not have the machine on a strong magnetic object nearby. Keep the machines steady on the desktop, do not put it unstable items. Do not put the machines on the vulnerable to squeeze place, to ensure normal machine use. Date transfer speed is also affected by computer and system environment. WIDE COMPATIBILITY The drive works with Windows 98 / SE / ME / 2000 / XP / Vista / Windows 10/8/7, all Version MAC OS. Specially designed for Apple Samsung ASUS HP Dell Sony Acer and other Macbook, Ultrabook, Netbook or Laptop PC without drive hardware. PLUG PLAY It is Powered by the USB port, no eject button, slot-loading; No driver program or extra power supply required. NOTE: Blank cd is unformatted, please download a software-NERO and finish the setting before burning. ULTRTHIN DESIGN Ultra-slim portable DVD drive, lightweight, it's convenient to use and carry whether at home or travelling, which only needs a little space in your bag. Product Dimensions: 7.2 x 7.1 x 1.3 inches. INTELLIGENT TECHNOLOGY Embedded cable design, made with premium wire drawing material of shockproof, low noise, anti-interference and high durability. works well in burning, writing and reading. WARRANTY AND SUPPORT We offer 45days full refund and 1 year quality warranty, please no hesitate to contact our customer service if you have any problems with the product. We promise to resolve the issue within 24 hours. USB 3.0 High Speed Interface With This external DVD/CD Drives for laptop, it provide you fast data transfer speed and stable performance. You can record CD, music, videos, install software or create CD/DVD backup disc. It is also compatible with USB2.0. Universal Compatibility The item is compatible with Windows 10 / 8 / 7 / 98 / SE / ME / 2000 / XP / Vista , all Version MAC OS systems. Support Laptop, Notebook, PC, Desktop Computer. For the desktops, please connect the device to the USB port on back of the motherboard for normal use. Easy to Use-Plug & Play NO driver program required. Powered by the USB port, plug and play. With an eject button so that you never have to worry about your disc getting stuck inside this external drive. Fashion Design Appearance The data cable is hidden behind the USB dvd player for laptop. It has a slim, lightweight and shockproof design, and stylish enough appearance, you can put this External CD Drive/DVD Writer/Player in the traveling bag or on your desk. Efficient & Stable - Adopted unique intelligent burning technology, this CD-RW drive supported DVD+R, DVD-R, DVD-RW, CD-ROM, DVD-ROM, CD-R, CD-RW. Max DVD read speed 8X; Max CD read speed 24X and max CD burn speed 8X, and a powerful error correction capability. External CD DVD drive, Blanco USB 2.0 Slim portable external CD-RW drive DVD-RW Burner Writer player for laptop notebook PC desktop computer, Black The external cd/dvd drive for Laptop Works compatible with windowsXP/2003/Vista/7/8.1/10, Linux and all version Mac OS systems, supports any PC, Ultrabook and Netbook. 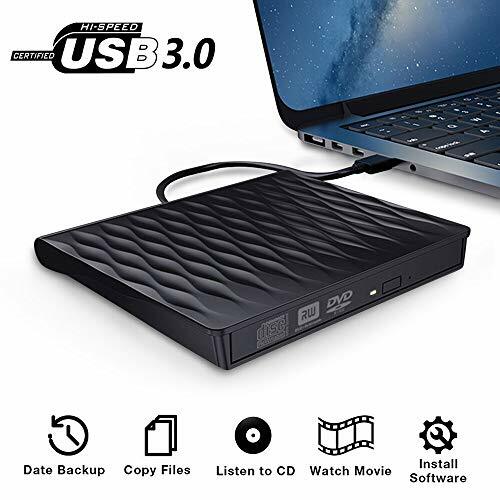 Get a high speed USB3.0 CD/DVD reader, writer and burner, you can enjoy movies, music, burn discs, install software and create backup discs and more on your laptop or desktop with Windows 10 / 8 / 7 / XP and Mac10 OS system. * Before you using the CD-ROM drive, make sure your computer has a "Media Player". * Please hook up the device to the direct USB port on your computer. If you connect it to a USB hub or extension cords, it maybe cannot recognize the Driver or not read the CD/DVD. * For the desktops, please connect the device to the USB port of the motherboard for normal use. 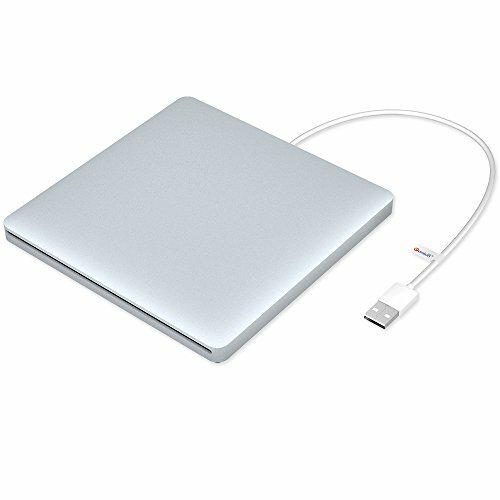 NOLYTH External CD DVD drive,supports Mac/MacBook Pro/Air,PC,Ultrabook and Netbook etc.We have designed a new appearance and connection mode,which can be used in USB and USB C interface computers. NOLYTH external cd drive is with the advantages of high quality, high compatibility,high performance,strong stability,high speed,our external dvd drive wins customers' approval.Meanwhile,this usb c cd drive has embedded unique burn prevention control chip,which can effectively prevent breaking the disk and gets super read disk error correction function while burning.This external cd dvd drive can help to back up your data and enjoy the high-fidelity sound quality DVD and CD which is burnt from our external dvd player. this external cd player can read CD, DVD, VCD and other formats disks. 1.NOLYTH usb c superdrive provides faster data transfer speed,up to 10Gbps.It is backwards compatible with USB3.0/USB2.0/USB1.0. 3.NOLYTH external cd burner supports to read CD,VCD,SVCD,CD-R,CD-RW,DVD-R/DVD-RW and write CD-RW,CD+RW,DVD-RW,DVD+RW etc. 4.Once order the external dvd burner,you will get a free drive storage case and usb3.0 adapter with high quality. 1.NOLYTH external optical drive is normal usb c dvd drive,not a blu ray dvd drive,so it can't play blu ray disc and work for tablet,such as iPad. 2.Please make sure the laptop is with sufficient power supply,a low capacity may cause the external cd drive can't be recognized. New Design USB C This is a new design usb c external cd dvd drive compatible with Apple/Mac/MacBook Pro/Air/Laptop/PC.Powered by USB C/USB port and embedded cable design, made with Aluminum Alloy material of shockproof,low noise,anti-interference and high durability.Works well in burning, writing and reading.No driver program or extra power supply required.Don't need to install software to set for driver. Easy to Use It is very easy to use,just plug and play,you just need to plug this external dvd drive into your USB C/USB port and the DVD drive will be detected.NOLYTH external cd drive is a perfect companion for computers without the internal drive.You can burn files,install software and create a backup CD.This CD DVD optical drive allows you to watch DVD/CD movies with no lag and burn music, movies to CD or DVD at any time. 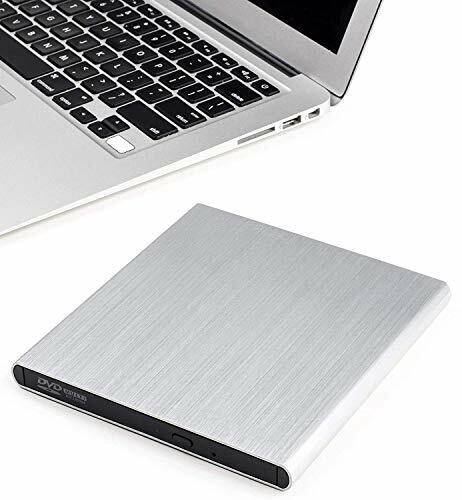 Widely Compatible NOLYTH external cd drive works with Windows 10/7/8/Mac OSX/XP/Vista,all Version MAC OS.Specially designed to compatible with Apple/Mac/MacBood Pro/Air/Samsung/ASUS/HP/Dell/Sony/Acer and other Ultrabook, Netbook or Laptop/PC without internal drive But with USB C or USB interfaces. Warranty and Package NOLYTH cd drive offered 60days full refund and 2 year quality warranty, technical support is available via:confolytech@outlook.com.When order this usb cd dvd drive,you will get a free usb3.0 adapter and a storage case for this external optical drive. 2.Before using the CD-ROM drive, be sure your computer has a "Media Player". If you don t have, please contact seller to have the download link. PLUG & PLAYP Easy to use. Rioddas external DVD drive is powered by USB port.No external driver and power needed. Just plug it into your USB port and the DVD driver will be detected. SUPPORT COMPATIBLE SYSTEM This DVD drive is ideal for various devices. It support Windows XP/2003/Vista/7/8.1/10, Linux, all version Mac OS system. For the desktops, please connect the device to the USB port of the motherboard for normal use. USB 3.0 is a new interface technology!Unlike USB 2.0, it allows fast data exchange between the drive and your computer and serves as power plug, so you won't need external power source.This cd dvd external drive convinces with its high speed of reading and writing data ,will bring you better experiences. 1,Customers using Windows 10 are advised to Install VLC Media player in order to Play DVDs and CDs. Windows didn't integrate the Media Player APP in the latest Windows versions. 2. The product is not compatible with iPad / Tablet PC and may be insufficient when used on tablets. Therefore not recommended to use on tablets. 3. With only the USB cable it can also work. But when the indicator light turn red or you feel the speed is slow, you need to connect the power cable. 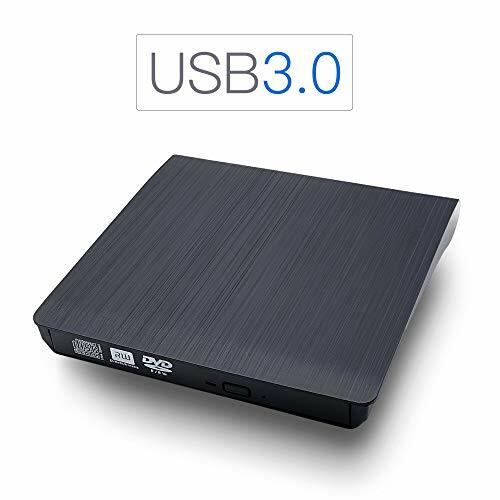 USB3.0 HIGH SPEED TRANSFER The external DVD burner floppy used USB 3.0 interface,bringing you faster data transmission speed, also compatible with USB 2.0,1.0. The highest DVD reading and writing speed up to 8x Max, CD up to 24x Max. Data transmission speed stability, up to 5.0 Gbit / s, which is 10 times faster than last generation drives. SUPER COMPATIBILITY New generation external usb dvd drive is ideal for various devices,perfect compatible with Windows 7/8/10/SE / ME / 2000 / XP / Vista and all versions of Mac OS systems. PLUG AND PLAY Just plug it into your USB port and the portable dvd drive will be detected. No driver and external power needed. Note: Please make sure you have a media player like VCL in your computer. VERSATILE-Adopted unique intelligent burning technology You can use our external floppy drive to burn files,and play,read with no lag or distortion. Support CD, CD-Text, CD-Extra, DVD+R/RW, DVD-R/RW, almost computer diskette playing and rewriting. 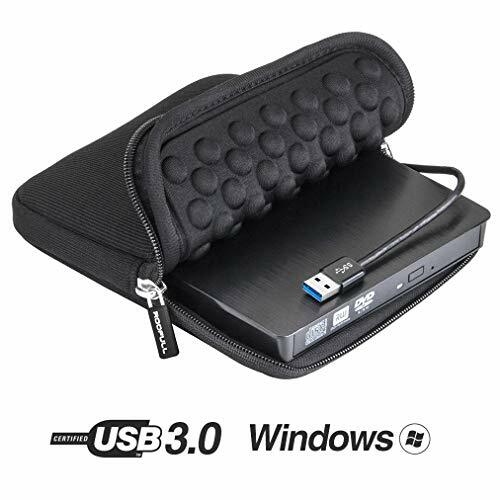 COMPACT DESIGN Ultra-thin, lightweight, compact and portable.With a small size body and an embedded USB cable mean the usb 3 dvd drive can be slipped in your travel bag. 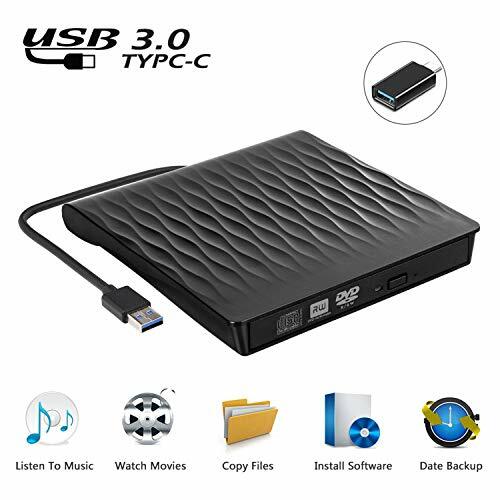 Sonkir USB 3.0 External DVD CD Drive is tray loading external portable CD DVD drive which is suitable to USB 2.0/3.0 connector desktop or laptop. Via the USB Interface, external drives and computers are successfully read information function. The CD Drives is suitable for Windows XP/Vista/7/8/10. It is specially designed for HP Dell Lenovo and others, ultrabook,netbook,laptop and desktop without drive hardware. It can help to back up your data and enjoy the high-fidelity sound quality DVD and CD which is burnt from our external cd dvd drive. Step 1: This product is a data line interface properly connected to USB port of the computer, the computer display lower right corner should appear device icon. Step 2: Click on the desktop, open the "my computer", in "the mobile storage device should display the drive icon". Step 3: Click on this icon button, select the "pop in the tray into the appropriate disk read. 1.The internal laser can be harmful to the eyes and face, please do not open it. 2.Do not keep the machine in a strong magnetic field nearby. 3.Please place the machine on the table stably, and do not put unstable objects. 4.Do not place the machine in an easily accessible location outside the press to ensure the function of the machine. This product has the unique anti-burning ring controlling chips, which avoid disk writing failure and enhancing error correction efficiency. 4. Botee external CD Drive supports to read CD,VCD,SVCD,CD-R,CD-RW,DVD-R/DVD-RW and write CD-RW,CD+RW,DVD-RW,DVD+RW etc. 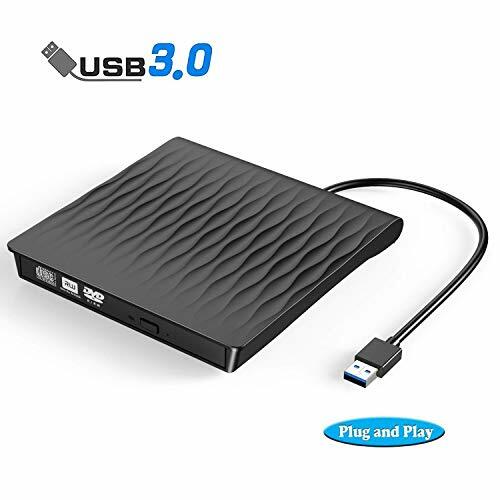 USB 3.0 High Speed - USB external cd dvd drive with advanced USB3.0 technology faster data transmission speed (up to a maximum of 5Gbps) and stable performance with strong fault tolerance more stable data transmission. Also compatible with USB 2.0,USB1.0-USB1.1. 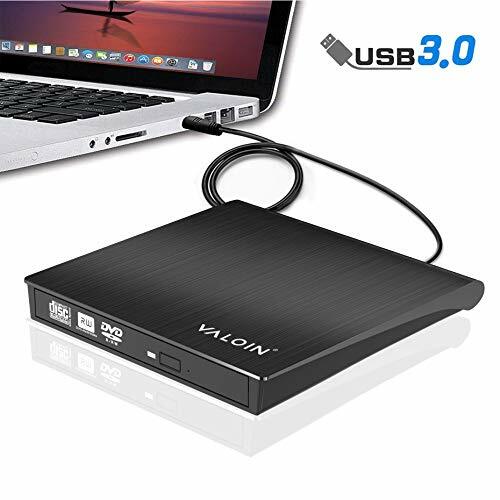 Compatible Systems - The external cd/dvd drive for Laptop Works compatible with windowsXP/2003/Vista/7/8.1/10, Linux and all version Mac OS systems, supports any PC, Ultrabook and Netbook.For the desktops, please connect the device to the USB. Optical Drive Function - Portable external CD drive For laptop with brand new chip supports all major dvd, support CD-R, CD-ROM, CD+/-RW, DVD-ROM, DVD-R, DVD+/-RW, DVD-R DL, VCD.Strong error-correcting ability, anti-shock and noise reduction technology,low power consumption. Easy To Install & Use -Plug and play,no extra drive, no need extral power supply, no need for any additional software. Powered by the USB 3.0 port, just plug it Into your USB port and the dvd driver will be detected. 100% High Quality - External CD drive embedded cable design, made with premium wire drawing material, external CD drive adopt 100% durable brand new DVD loader which is more stable. We believe in the quality that we are backing it up with lifetime warranty and we 100% stand behind our products. Any questions, just contact us freely. Kingbox External CD/DVD drive, supports Mac/MacBook Pro/Air, PC, Ultrabook and Netbook etc. We have designed a new appearance and connection mode, which can be used in USB 3.0 and USB C interface computers. Kingbox external CD drive is with the advantages of top quality, wide compatibility, best performance, strong stability, high speed, our external DVD drive wins customers' approval. Meanwhile, this DVD drive has embedded unique burn prevention control chip, which can effectively prevent breaking the disk and gets super read disk error correction function while burning. 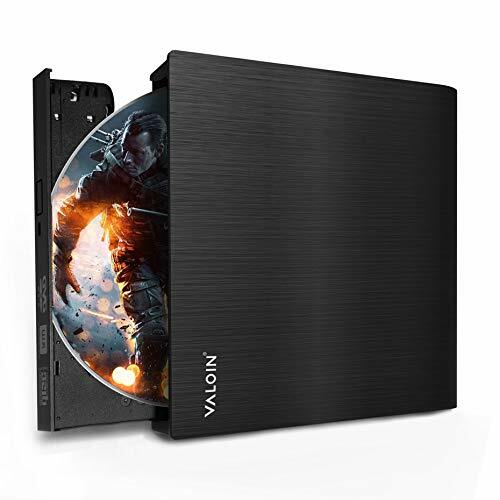 This external CD/DVD drive can help to backup your data and enjoy the high-fidelity sound quality DVD and CD which is burnt from our external DVD player. this external cd player can read CD, DVD, VCD and other formats disks. 1. Kingbox USB 3.0 Type-C DVD drive provides faster data transfer speed, up to 10Gbps. It is compatible with USB 3.0/USB 2.0/USB 1.0. 2. Made of all-Aluminum Alloy, unique configuration design, easy to install, Plug and Play, No Any Other Driver Required (Excluded Windows 98SE). 3. Kingbox external cd burner supports to read CD, VCD, SVCD, CD-R, CD-RW, DVD-R/DVD-RW and write CD-RW, CD+RW, DVD-RW, DVD+RW etc. 1. Kingbox external optical drive is normal USB DVD drive, not a blu ray DVD drive, so it can't play blu ray disc and work with tablet, such as iPad. 2. Please make sure the laptop is with sufficient power supply, a low capacity may cause the external CD drive can't be recognized. 3. Date transfer speed is also affected by computer and system environment. Why You Need an External Drive? According to our market research, many manufacturers have eliminated the built-in optical drive of the computer in order to make the laptop thinner and lighter, which has caused a great inconvenience to many people. 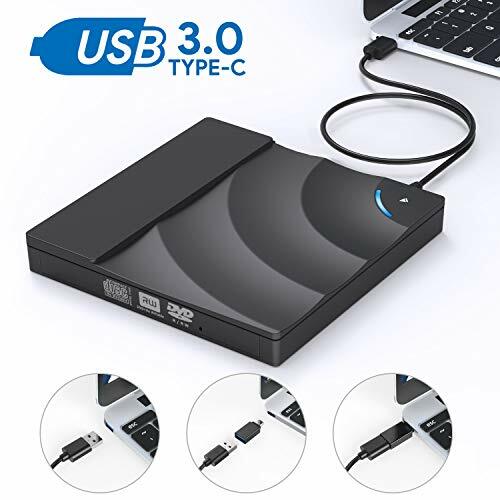 This USB 3.0 & Type-C external optical drive is specially designed for Apple Samsung ASUS HP Dell Sony Acer and other Macbook, Ultrabook, Netbook or Laptop PC without drive hardware, helping you record CD, music, videos, install software or create CD/DVD backup disc. Noted 1.Please make sure the laptop is with sufficient capacity, a low capacity may cause the device can't be recognized. 2.For Apple laptop, it can not be used the button to eject the disc directly. After you have finished importing the file, please right click on the drive icon "Eject "Audio CD"", then the disc will pop up automatically. 3.The new released Windows system have discontinued the internal DVD media player software, customer using Windows 10 and above are advised to Install VLC Media player to Play DVD and CD. 4.Please hook up the device to the direct USB port on your computer. If you connect it to a USB hub or extension cards, it maybe cannot recognize the device or cannot read the CD/DVD. 5.If the button to open the disc does not work, please use the forced ejection hole. Specifications: Read speed : DVD-ROM 8x; CD-ROM 24 x Write speed: DVD 8x; CD 24x Support CD size: 3.1 inch / 80mm; 4.7 inch / 120mm Support CD format: DVD-ROM, DVD-R, DVD+R, DVD-RW, DVD-R DLCDA, CD-ROM, CD-R, VCD, CD-RW Dimensions: 5.7 X 5.5 X 0.6 inch Weight: 0.78lb / 0.35 kg Warranty We promise a 30-days Money Back Guarantee and a 180-Day Limited Product Warranty. If you have any issues, please contact our Service Team freely, we will respond to you within 24 hours. Portable CD/DVD Drive This external optical CD drive have an advantage in watching DVD/CD movies, burning music, installing software or creating CD/DVD backup disc, which is a good helper for your work, life and study. Works well in burning, writing and reading. 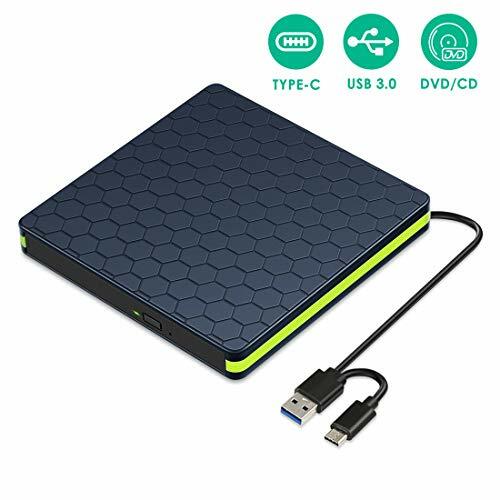 USB 3.0 & Type-C This DVD drive is suitable for the devices with USB 3.0 or Type-C interface, which is backwards compatible with USB 2.0 and USB 1.0. The max transmission speed is up to 5Gbps on USB 3.0. The Type-C interface is specially designed for the computer without USB3.0 interfaces. Plug & Play No driver and external power required. 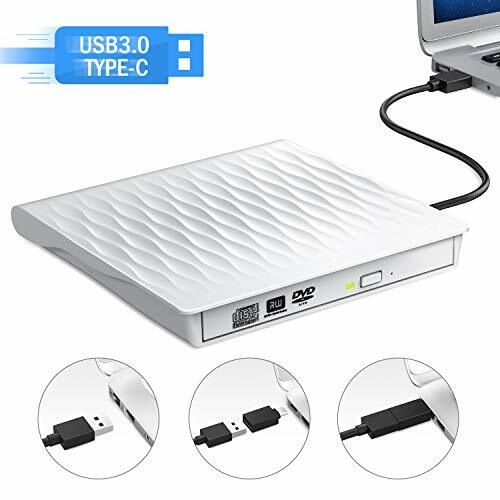 Just plug external DVD drive into your laptop USB interface, press pop-up button and put disc on tray, it will be automatically recognized and play. For the desktops, please connect the device to the USB port of the motherboard for normal use. Unique Design Embedded cable design, made with premium material of shockproof, low noise, anti-interference and high durability. It features strong error-correcting ability, anti-shock technology, low power consumption. It is portable for traveling with your laptop thanks to its small size, which can be used at any time. With this external USB 3.0 CD/DVD drive burner, you can watch DVD movies, burn files, movies to a CD/DVD, install software and create backup discs etc. USB 3.0 CD / DVD drive provides faster data transfer speeds up to 5Gbps. Also compatible with USB 2.0 / 1.0. Easy to install and use. No additional drivers and power supplies, fully plug and play. Support Windows 2000 / XP / 2003 / Vista / 7 / 8.1 / 10, Linux and all versions of Mac OS system, support any PC, Ultrabook and Netbook. But not for TV. The external CD drive supports reading CD, VCD, SVCD, CD-R, CD-RW, DVD-R / DVD-RW and writing CD-RW, CD + RW, DVD-RW, DVD + RW and so on. Ultra-thin, lightweight and easy to carry. 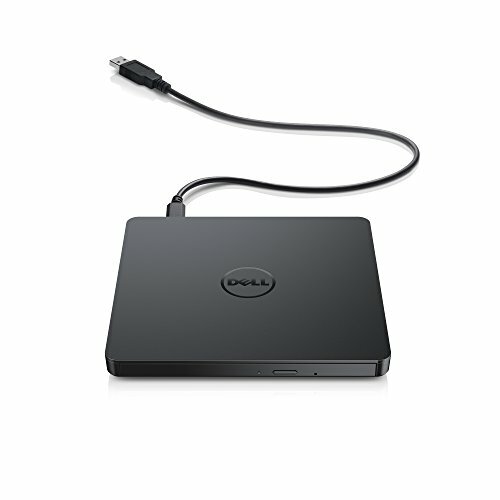 It is the perfect companion for all computers without a built-in drive. Compatible Operation Systems: Windows XP/2003/VISTA/7/8.1/10,Linux,Mac 10 OS System and More. Compatible equipment: PC,Laptop,Comprehensive Computer,Super PC,Internet PC hard disk reader. 1. Connect the device directly to the computer's USB port if you connect it to a USB hub or extension dock, the drive or CD/DVD may not be recognized. 2. For desktop computers, please connect the cable on USB port of the desktop to ensure that the power supply is normal. 3. It is recommended to use Windows 10 and above to install VLC media player to play DVDs and CDs, because the newly released Windows system has stopped using the internal DVD media player software. 4. The device does not support TV/tablet/Smart phone/car. 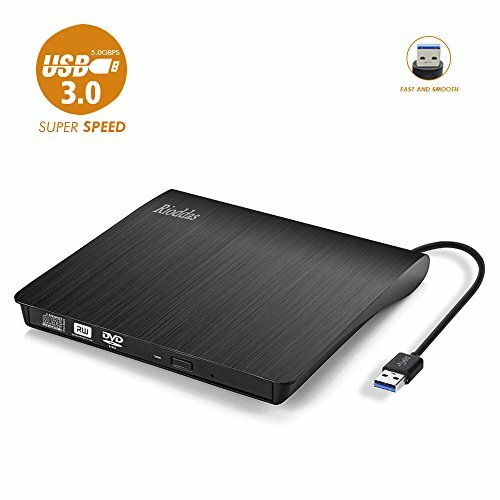 USB 3.0 SPEED - This USB external CD DVD drive uses USB 3.0 interface to provide you with faster data transfer speeds (up to 5Gbps) and more stable performance. It is also compatible with USB 2.0/1.0. In addition, the embedded cable design is neat and light, easy to carry; the texture shell design brings good tactile and visual enjoyment. MULTI-PURPOSE MACHINE - The external CD drive is equipped with a branded laser head movement, supporting CD, CD-R, CD-RW, DVD-RW, DVD R, DVD R DL, DVD RW, DVD-RAM and DVD. The error correction capability is very powerful, quiet and noiseless, low power consumption, and impact resistant. SUPER COMPATIBILITY - This external DVD drive is compatible with Windows 2000 / XP / 2003 / Vista / 7/8/10, Linux, Mac OS, and is ideal for laptops, PCs, desktops and more. Note: For desktops, connect the device to a USB port for normal use. EASY TO INSTALL AND USE - This USB drive requires no additional drives and external power, just plug it into the USB port to detect the DVD driver. It can burn files, install systems, install games and create backup CDs. In addition, the CD DVD-RW burner allows you to enjoy DVD/CD movies without delay and convert music and movies to CD or DVD. It is the perfect companion for all computers without a built-in drive. GUARANTEE AND WARRANTY - Our external CD DVD drive is more stable with a 100% durable new DVD loader. We offer 24/7 online support and a lifetime warranty from the date of purchase. We hope that all customers are 100% satisfied. If you have any questions about our USB external CD DVD drive, we will ensure a refund or replacement. DORISO external CD/DVD drive is upgrade version with 100% brand new DVD loader, provide more stable and faster data transmission. Support Systems: Windows 2000/XP/2003/Vista/7/8.1/10, Linux and all version Mac OS systems, supports any PC, Ultrabook and Netbook. Multi-function: External CD Drive supports to read CD,VCD,SVCD,CD-R,CD-RW,DVD-R/DVD-RW and write CD-RW,CD+RW,DVD-RW,DVD+RW etc. It features strong error-correcting ability, anti-shock and noise reduction technology. Please hook up the device to the direct USB port on your computer. If you connect it to a USB hub or extension cords, it maybe can't recognize the CD driver or not read the CD/DVD. Customer's using Windows 10 are advised to have VLC Media player to Play DVD and CD. Before using the CD-ROM drive, be sure your computer has a "Media Player". 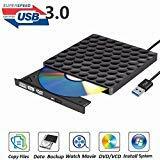 ADVANCED USB3.0 INTERFACE - External CD Drive comes with standard USB3.0 high speed interface, provide more faster and stable data transfer speed. Embedded cable design made it easy for storage, you can take it anywhere with slim, lightweight, compact, portable size. 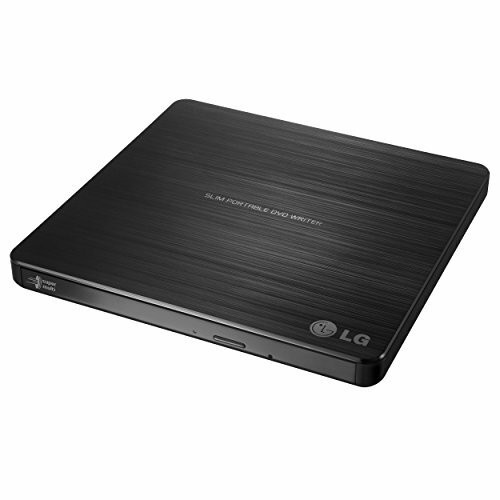 STRONG COMPATIBILITY - This external dvd drive is ideal for various devices. Compatible with windows 2000/ XP/ 2003/ Vista/ 7/ 8/ 10, Linux, all Mac OS system, laptop, notebook, PC, desktop computer and other system. For the desktops, please remember to connect the device to the USB port for normal use. PLUG & PLAY - Easy to install and use. Powered by the USB port, no external driver required, run automatically after connect to USB port. 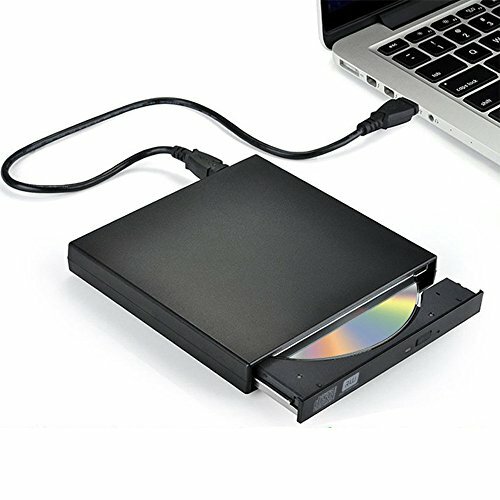 You can use our portable External CD/DVD Drive Writer/Player to burn files, install software and create a backup CD which is a perfect companion for computers. 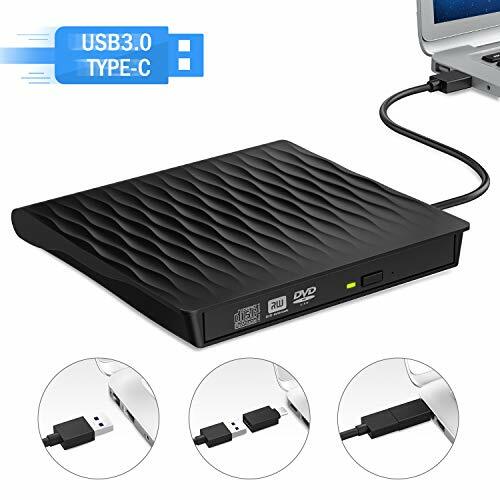 EXCELLENT MULTI-FUNCTION - This external dvd drive for laptop adopted advanced chip, support CD, CD-R, CD-RW, DVD-RW, DVD R, DVD R DL, DVD RW and DVD-RAM, it features strong error-correcting ability, anti-shock and noise reduction technology, low power consumption, no external adapter needed. FIVE STARS WARRANTY - Our external CD drive adopt 100% durable brand new DVD loader which is more stable. We believe in the quality that we are backing it up with lifetime warranty. Feel free to contact us if you have any problem. Support replacement and resent with 24 hours friendly customer service.